What is non-taxable per diem vs taxable per diem for flight crews? What is non-taxable per diem vs. taxable per diem? Why is it important for pilots or flight attendants to know what their non-taxable per diem is if writing off the per diem calculation? Non-taxable per diem reimburses pilots and flight attendants for M&IE expenses that involved overnight travel away from their tax home. This assumes that their employer is set up to provide per diem via an accountable plan. If so, pilots and flight attendants should see their non-taxable per diem reported on their W-2, Box 12, Code L.
If non-taxable per diem is not in Box 12, where else should pilots or flight attendants look for the number? Sometimes this number is shown on the W-2 in Box 14. If it is not there, crewmembers should look at their last paycheck stub for the applicable tax year to see how much non-taxable per diem they received for the year. Note that Box 12 is divided into 12a, 12b, 12c, 12d above. The a, b, c, and d above are NOT codes. 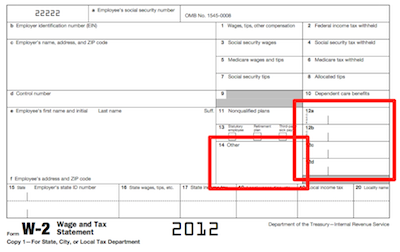 They simply allow for more than one code to be entered into box 12. Non-taxable per diem could be in any of those spots on your W-2 and will be marked with a Code L. It is also important to note that Code L could contain other reimbursements in addition to non-taxable per diem. Code L is for non-taxable reimbursements for employee business expenses, and is not necessarily limited to M&IE reimbursements. For that reason, we recommend using the last paycheck stub that a pilot or flight attendant received for a given tax year as an added resource to figure out how much non-taxable per diem he or she received. How does non-taxable per diem affect the per diem deduction? The per diem deduction is calculated by first determining your M&IE expenses, then subtracting the non-taxable per diem reimbursement, and lastly making IRS adjustments (via IRS Form 2106, TurboTax, or TaxCut). About.com article - shows meaning of "Code L"